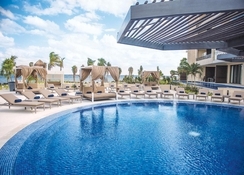 Royalton Riviera Cancun is a family friendly all-inclusive hotel located on a private beach in Cancun. Taking luxury to the next level, this iconic property offers its Royalton signature All-In Luxury package to guests seeking posh accommodation, DreamBeds™, All-In Connectivity™ including free calls to the United States along with a few other countries, and a large Splash park. Guests are welcomed by the warm reception staff and offered a chilled cocktail on arrival, during their stay guests can enjoy unlimited reservation-free dining at its nine fine-dining restaurants, sip drinks at 13 gorgeous bars and relax in the private beach. Step into this haven of hospitality and experience luxurious living at its best. The hotel is located on a private beach, away from the busy city, in a secluded part of Cancun. It is 9.1km from Wet 'n Wild Waterpark in Cancun. The El Rey ancient Mayan ruins are 14.2km. 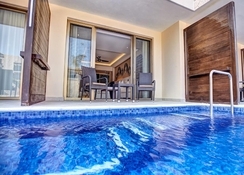 Royalton Riviera Cancun is 11.2km from the Cancun International Airport, a 15-minutes’ drive. 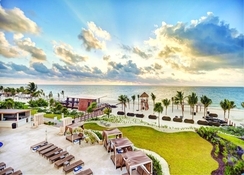 The Royalton Riviera Cancun offers two types of accommodations each with its own unique experience. Broadly the rooms are categorised as Luxury and Diamond Club™. 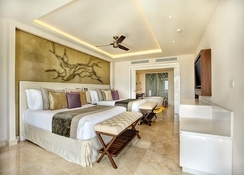 The Luxury rooms available for guests are: Luxury Junior Suite, Luxury Suite with Terrace Jacuzzi, Luxury Family Suite and Luxury Presidential One Bedroom Suite. Guests can upgrade to the Diamond Club™, which is a premium club offering the best services. 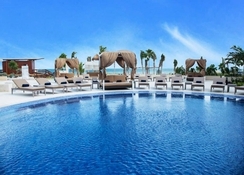 The club gives its guests access to exclusive bars, restaurants, swimming pools and a private beach area. All the luxurious rooms and suites come with unlimited Wi-Fi, balcony or terrace offering excellent sea views, Bluetooth audio, in-room safe, satellite TVs, ironing board, coffee maker, minibar, rain showers and hairdryer. They also feature signature DreamBeds™ with high thread count sheets. The Hideway is a resort-within-resort concept for Adults Only experience in luxury. For a small fee, online room selection can be done. 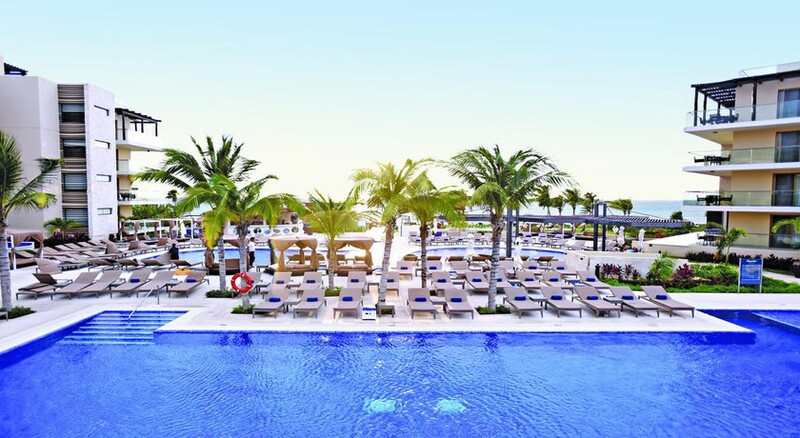 At the Royalton Riviera Cancun, as many as nine restaurants and 10 bars let you relish local and international cuisine, lovely cocktails and mocktails in a wonderful and luxurious ambience. There are options of healthy diets, fresh fruit juices, and kids buffet area. While Gourmet Marche is an International Buffet restaurant, Zen is for Japanese Cuisine, OPA! is for Mediterranean cuisine, and Hunter Steakhouse is for authentic Steaks. There are Italian, Mexican, Caribbean eateries as well. There is a sports bar where you can catch up with all major sporting events, and a café too. Diamond Club™ members enjoy access to two exclusive bars: Diamond Club™ Lounge and Diamond Club™ Beach Bar. The hotel has a lovely beach, a Splash park with exciting rides and pools where all members of family can have splash-tastic fun. There is a lovely Royal Spa offering rejuvenating massages, hydrotherapy and full-service health facility. Catch-up on your favourite sports at the SCORE Sports Bar and Lounge or chill out by the fascinating pools. Fitness enthusiasts can stay in shape at the state-of-the-art gym. The hotel also offers spinning classes, yoga, pilates, zumba, TRX training, kickboxing and tennis. The hotel's spa offers relaxing massages, body treatments and facials that will truly recharge your batteries.